*Price per license. Quantity must be 2 or greater. 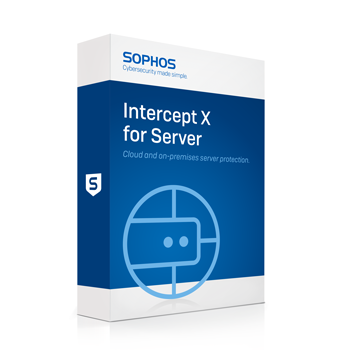 Sophos Intercept X for Server locks down your server with a single click, whitelisting your applications to secure servers in a safe state and preventing unauthorised applications from running. Sophos automatically scans the system and establishes an inventory (whitelist) of known good applications without the need for manual rule creation. Sophos creates an unbreakable bond between applications and associated files, such as DLLs, data files, and scripts. Managing your security from Sophos Central means you no longer need to deploy servers to secure your systems. Sophos Central, hosted by Sophos, provides instant access with no console servers to set up. Sophos Central provides out-of-the-box policies for servers while also managing other Sophos products, including Sophos Intercept X, Mobile, Wireless, Email, and Web - all from a single pane of glass. Sophos Central Server Protection gets a host of new features to further enhance your protection. We’re also updating the license names to better reflect these new capabilities. The artificial intelligence built into Intercept X Advanced for Server is a deep learning neural network, an advanced form of machine learning, that detects both known and unknown malware without relying on signatures. Denies attackers by blocking the exploits and techniques used to distribute malware, steal credentials, and escape detection. This allows Sophos to ward off evasive hackers and zero-day attacks in your network. Protects against advanced hacking techniques performed by attackers to establish their presence on a device, steal credentials, escalate privileges, or gain more enduring access, including Code Cave mitigation and credential theft protection. Advanced anti-ransomware protection, preventing adversaries from encrypting the master boot record (MBR). Detailed, forensic-level analysis illuminates the root causes of attacks and their infection paths, and offers guidance to help remediate infections today and bolster your security posture. Monitors HTTP traffic for signs of connectivity to known bad locations such as command and control servers, an early indicator that a new piece of malware may be present. Synchronized Security simplifies and unifies defenses with real-time intelligence sharing between your servers and firewall. Get better protection against advanced threats and spend less time responding to incidents. Provides control of potentially inappropriate websites for acceptable use by site category. Point-and-click blocking of applications by category or by name. Enables administrators to block certain legitimate applications from running on servers. Enables you to monitor and manage access to removable media and peripheral devices connected to your physical servers. Designed to reduce the risk of accidental data transfer to removable storage devices, corporate web browsers, email clients and IM clients. Provides the ability to monitor and control the native firewall on Windows servers. Attackers take advantage of unused cloud regions to avoid detection. Sophos now discovers workloads in every public AWS region, even the ones you are not actively using. Sophos for Virtual Environments enables malware detection to be offloaded to a centralized Security VM to reduce the potential performance impact on Windows virtual servers. Licensed per virtual server, with entitlement to the Sophos for Virtual Environments alternative deployment option included with all Sophos Server Protection licenses. For Windows Servers on VMware ESXi and Microsoft Hyper-V, a light guest VM agent off-loads malware scanning to a centralized Security VM. Anti-malware, Live Protection, Malware Removal.